Rava Idli ~ The one thing that my husband has actually craved for and pestered me to make 🙂 Honestly, I was happy with the readymade idli/dosa batter that is available in the supermarket because despite trying several combinations of rice and dal I could never get the perfect batter. Either the batter wouldn’t rise or the flavour wouldn’t be the same. Then I concluded that it wasn’t my cup of tea. I couldn’t possibly slave over perfecting the same recipe over and over again, could I? Well, this was a lame excuse actually because everyone in my family knows that I don’t sit still until I master a recipe, no matter how many attempts it takes. There’s this particular Mangalorean sweet that I am almost on the verge of perfecting, after 9 attempts. So yes, I am obsessed with perfection only when it comes to getting a recipe right. Otherwise, I expect the least amount of perfection from life. So, coming back to today’s recipe. The husband and I have grown up eating in several small eateries in Mangalore – hotels as we call them. We either ate there before we headed for our tuition classes or gathered with friends from college or just dropped by to take a break from our shopping in Hampankatta. I know that most of you may relate to this. You aren’t a Mangalorean foodie if you haven’t eaten at these small joints that served piping hot idli-sambar, potato or beetroot bonda, goli baje , buns and sheera . During peak hours everything would get sold off quickly like hot cakes, literally. Soft & spongy idlis that were slightly grainy in texture have and will always remain to be my favourite go-to comfort food. 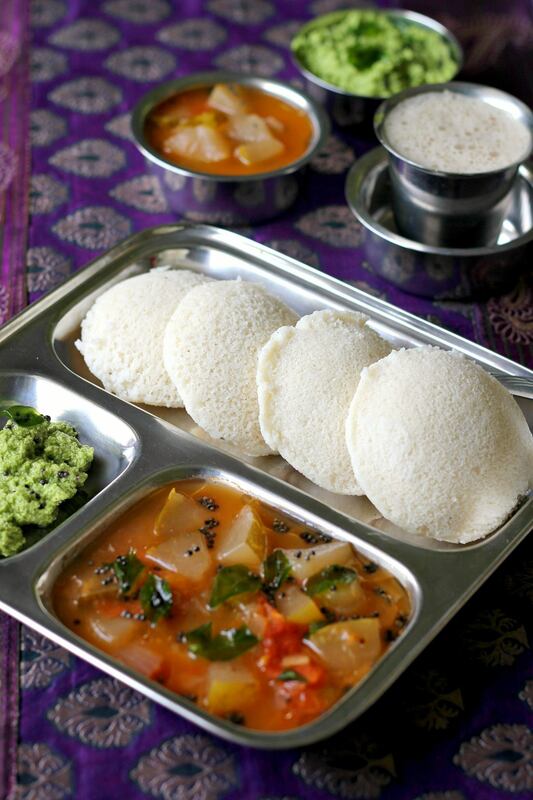 Nothing can beat the taste of those large, fresh idlis with slightly jagged edges served with some super piping hot sambar, generally made with field marrow (Mangalore cucumber/southey kayi) and washing it all down with some tongue-scorching, bitter-sweet filter kaapi (coffee). 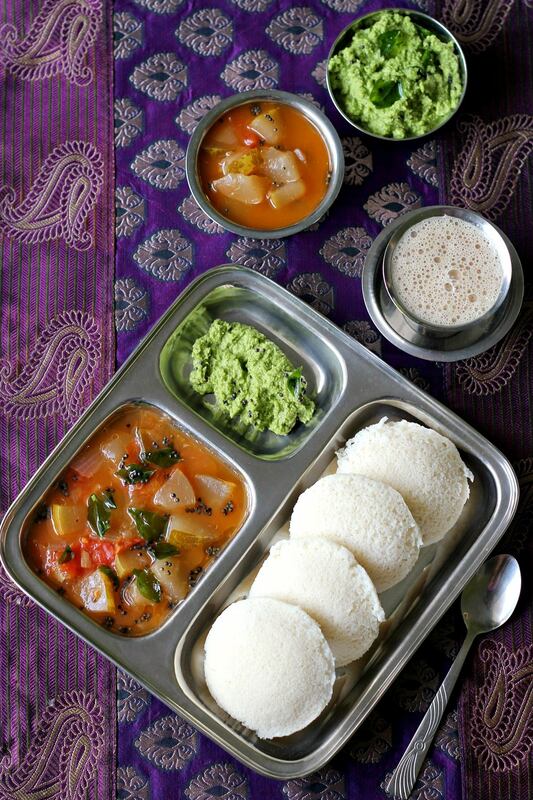 So today I leave you with these images of idlis that perhaps will help stir up some fond memories of back home. 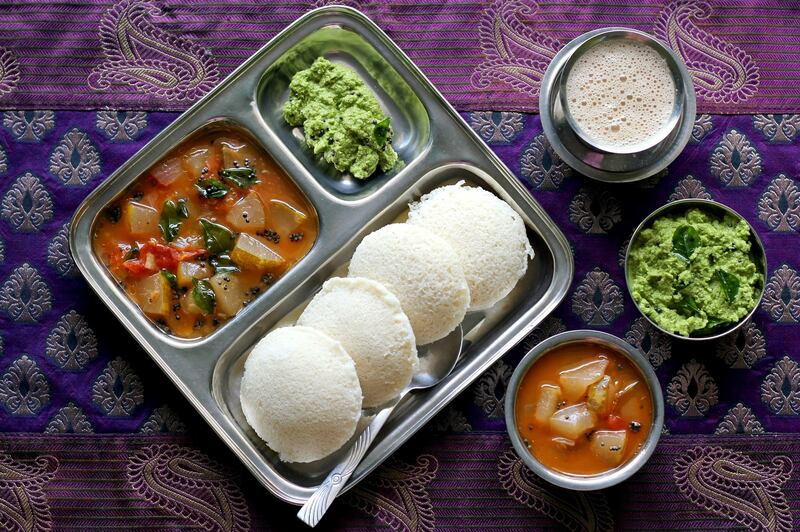 You don’t have to be a Mangalorean like me to love idlis. 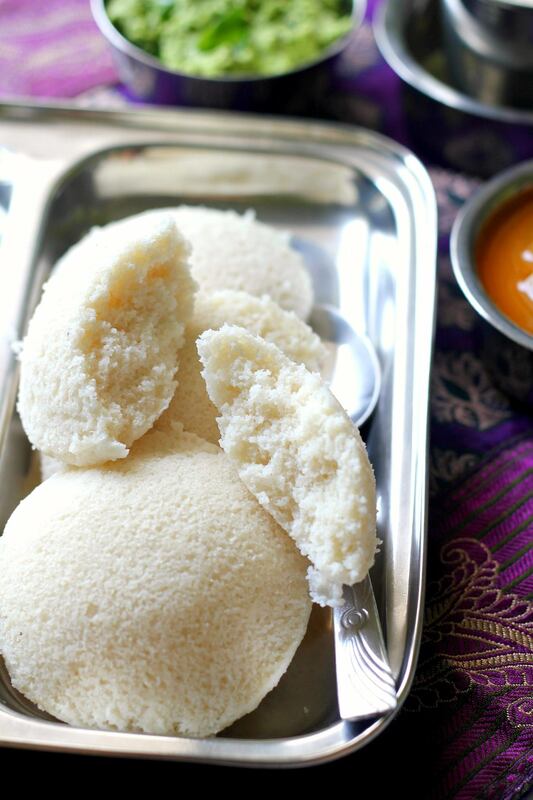 You can be from any part of India or the world, if you have been lucky enough to have tasted these pillowy soft steamed rice cakes that are a powerhouse of nutrition and taste, all rolled in one! Soft & spongy rava idlis taste so wonderful with sambar, chutney or any veg/non veg curry as they are porous and perfect to soak it all up! Wash the urad dal in 2-3 changes of water. Then soak it along with the methi seeds in sufficient water. If the rice rava is homemade, then soak it too in a separate bowl. If you are using store bought rava then place it in a bowl, add water and let the rava settle down, then gently tip the bowl to discard the water. Be careful as the rava may get drained off. Repeat once more. Then soak in sufficient water. All these ingredients must be soaked for at least 3-4 hours or overnight. If you intend on using the beaten rice, then it can be soaked for 20 minutes before grinding the batter. Drain the urad dal and methi seeds and grind it using 2-3 tablespoons of water till it turns frothy. Remove this into a vessel. If the rava you are using is very fine, then just squeeze it out of the water in which it was soaking. Make sure to squeeze out as much water as possible and add it to the vessel in which the ground urad dal has been placed. If the rava you are using is coarse, then squeeze it out of the water and pulse it for 2-3 seconds in the same mixer jar. Then transfer to the vessel. If you are using the beaten rice, squeeze it out and grind it to a smooth paste before adding to the batter. Now using your hands mix the batter gently till everything is incorporated well. Do not add the salt at this stage. Cover the pan with a well fitting lid and place it in a warm spot of your kitchen to ferment. Fermentation can take anywhere between 6-14 hours depending on the weather. If you live in a colder weather you can place the vessel inside your oven and turn on the light - do not turn on the oven unless your kitchen is frigid. Even then the temperature should be around 30 degrees C at the most. When the batter has fermented, add salt to taste and gently stir once. 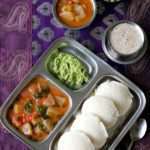 Place sufficient water in a idli steaming container and bring it to a boil. 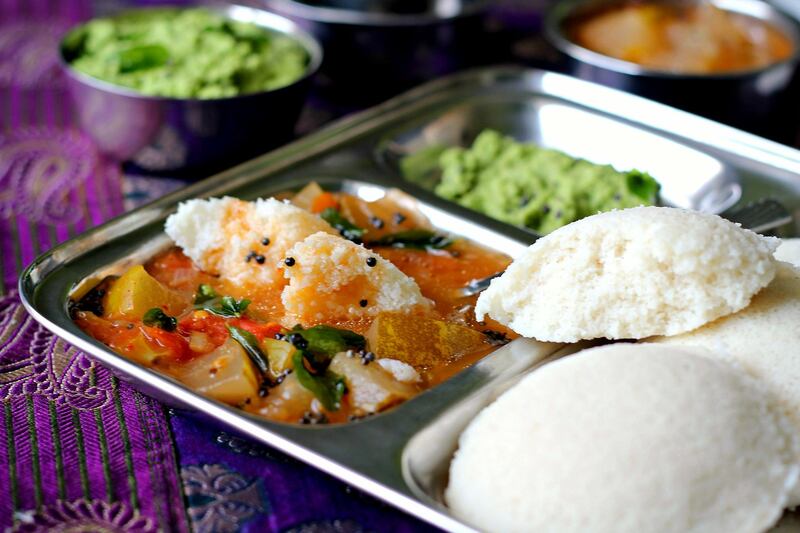 Grease idli moulds with a little oil (even on the edges) and fill them to the brim with the prepared batter. When the water comes to a rolling boil and you see a lot of steam arising, carefully place the idli stand with the moulds on it into the steamer. Cover and steam for 12-13 minutes. Then turn off the heat and allow a resting period of 1 minute. Carefully open the steamer to prevent the steam droplets from falling on the idlis.